Every day, Watch This offers staff recommendations inspired by a new movie coming out that week. This week: The release of both Nightcrawler (to theaters) and Thom Andersen’s seminal essay film Los Angeles Plays Itself (to Blu-ray) has us thinking back on other films about the City Of Angels. Boorman’s Los Angeles is beautiful, in its way. The sleek lines of its faceless facades are elegant. Under his lens, L.A. is an endless parade of used car dealerships, strip malls, parking garages, and other impersonal spaces, lit by the flat, oppressively bright sun during the day and gaudy neon at night. Its imposing steel-and-glass structures loom over the ant-like people below, when there are people around at all. (For the most part, no one is on the street, even as the sound of traffic hums steadily in the background.) This is the last exit on the grand interstate highway of the American Dream, the urban equivalent of the suburbs that popped up like concrete toadstools across America after WWII. 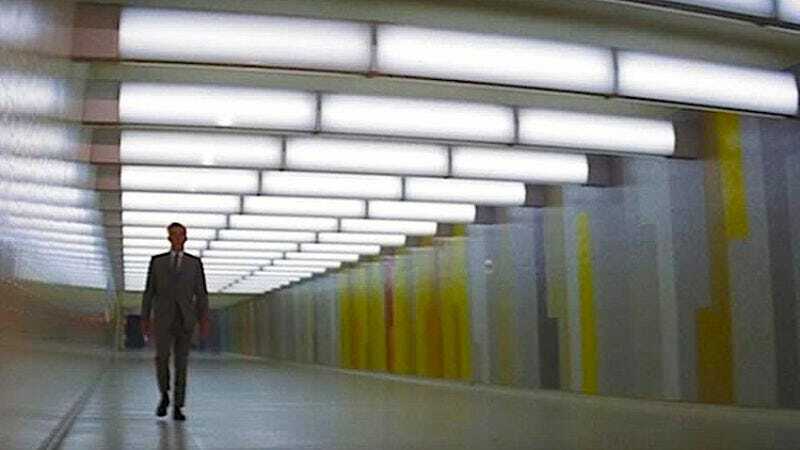 It’s no coincidence that two of the film’s key scenes take place in huge, echoing concrete landscapes—underneath the Four Level Interchange (only L.A. would have a freeway interchange as a landmark) and the L.A. River’s famous 6th Street Viaduct. L.A.’s blank expression matches that of our hero, Walker, who works for a similarly dispassionate, corporatized crime syndicate known as “The Organization.” These gangsters are not flashy Mafia types, but white Anglo-Saxon men in business suits, more macaroni and cheese than spaghetti bolognese. Walker himself is a cipher, a man of great violence and great restraint who clearly influenced Ryan Gosling’s character in Drive. He is as chilly and smooth as the ubiquitous sliding glass doors that appear throughout the film, if much less transparent. Brewster: You’re a very bad man, Walker, a very destructive man! Why do you run around doing things like this? Walker: I want my money. I want my $93,000. Brewster: $93,000? You threaten a financial structure like this for $93,000? No, Walker, I don’t believe you. What do you really want? Walker: I— I really want my money. There’s nothing under the surface. It really is just business. It’s not his anger that makes Walker dangerous, but his lack of empathy. Availability: Point Blank is available for rent or purchase on Amazon. It’s also on Blu-ray and DVD, which can be obtained through Netflix or your local video store or library.